You are here: HomenextTopicsnextTrade and businessnextFactoriesnextHarrimondsnextHarrimonds 1962 - recognise anyone here? 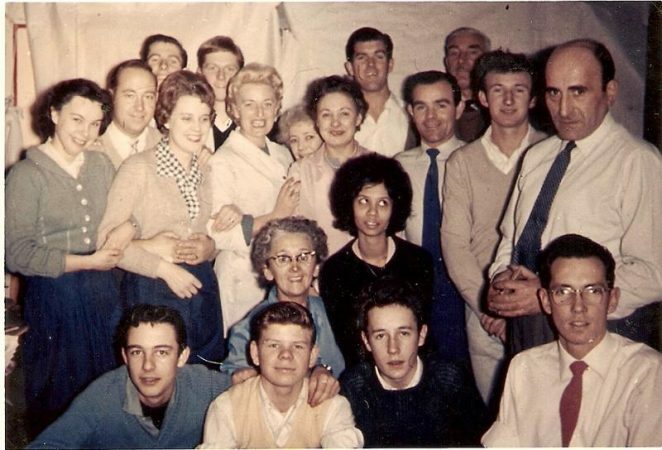 I worked at Harrimonds for a happy couple of years and remember they were a very friendly crowd and several came to my 21st birthday bash in 1962, the same year I think that this photo was taken. Unfortunately I can only remember the names of Frank Read and Fred Lankstead. I think the picture is of The Cutting. Room staff. Harrimonds was situated at The Hyde, Lower Bevendean, and it manufactured clothing for domestic and industrial wear. Can you recognise yourself or anyone else here? If you can help identify anyone, please leave a comment below. Hi Fred, I worked at Harrimonds in 1957, I was 15. I was only there about 9 months, then I went to work in a shirt factory in Western Road. I loved it in Harrimonds on the machine, but I can’t remember our supervisor’s name, she was rather bossy. I lived in Whitehawk at the bottom of the racehill. I used to walk all up the racehill to catch a bus to Bevendean. The boy in the front row, second from the left, looks very familiar, but I can’t think of a name. We moved to Somerset when I was 16, been here ever since, but I did love Brighton. I worked in the cutting room in the early eighties.The tall guy in the back row was there when I was. He is Ray Howell. I worked at Harrimonds in the despatch department with Charlie Hunt, whose wife Janet also worked there. Some of the names I can remember are Dennis Frost, Peter Wycombe, Frank Read, Fred Langstead, Chalkie White, Ron Mason. There were several others but can only think of their christian names. I also remember several faces in the photo but cannot remember names to faces. I was later transferred to Lorrels at Portslade where I worked until the factory closed down. Being an old Lower Bevendean girl, I recognise some of these faces. Frustrating not to recall names. The man behind the chap with glasses, the chap second back left, the chap second left front. Front row second from left is Charlie Shipley. Is Thomas Victor Fulker the same Vic Fulker that appeared in a childrens’ book called The Dustman, in 1984. If so, could you please contact me. I worked there between January 1979 and June 1981. I know four people in this photo: Tony (bottom right), the guy wearing glasses, completely deaf, but I was able to communicate with him easily. A real nice guy. The guy between the two men wearing ties is Fred. I knew him when he had a full beard; Ray Howell, the guy in the back row, second to the right who never married but had most of the ladies of a certain age in the main factory swooning after him. He was my supervisor; and Frank, the guy pictured between the two ladies seen on the left of this picture. He was my manager and he was the one that interviewed me for a job at this cutting factory in January, 1979. I was the barrel boy during my time there responsible for transferring cut bundles of cloth to the main factory opposite the cutting factory. I also cut cloth. I remember one of the respondents, Steve Reeves. I hope you are well. Have come across this site by accident. Anyway, my sister, Barbara Donaldson (nee Simmonds), worked as a machinist at Harrimond from late 1950s to 1970s and my mum, Florence Simmonds, was a presser from 1950s to 1980. Anyone remember them? To Greg Lucas. I am the Vic Fulker in the book. I worked as a machinist from 1959 to 1978 when I married. I remember Freddie Lankstead and several of the other faces, but can’t put names to them. My sister Susan also worked there until they closed. She still lives in Brighton, I live in Ringmer. I have printed the picture for my sister to see if she remembers anyone. We recognise the 2 young lads in the front row, possibly twins, can’t remember names. I worked at Harrimond the Hyde in 1971 as a night security guard and also as a bus driver picking the women up for work in the morning and taking them home again after work. They also started a part-time stint for the girls in the evenings where I would also pick the girls up and take them home again to drop-off points. I’m sure that Thomas Victor Fulker is right about Charlie (Michael) Shipley being second from the left in the front row. Our families lived two doors away from each other in Whitehawk Avenue. My surname was Sutton then. And Mick Peirson, you haven’t answered my question asking if you have a sister called Pip. We believe the fair-haired lad, back row, second left, is George Hammond who later joined the Brighton Fire Brigade. This is addressed to Barbara Etherton. So Barbara, where is the question posted where you are asking about my sister? Hello Barbara. Sinister I am not worried about. I remember Sue from my street when we were kids. I am afraid that my sister and I have been incommunicado for some years now, the last I heard of her she was living in London somewhere. Best wishes. Hi Mick, Thanks for responding and very sorry to hear about the rift. Hope all is well with you – I enjoy reading your comments about the ‘old’ days even if you are older than me! I think that if you used the Broadway Cafe (as it was then), you may have well known one or other of my brothers, Michael or Robin Sutton.